I ran into SnoozeShade at a Baby expo in Atlanta this year and they were so kind to send me home with their product to test out. I love walking with my Lil' Peanut in the morning after I drop the big girl off at school but it always rolls into nap time. So I was all about trying out the SnoozeShade. 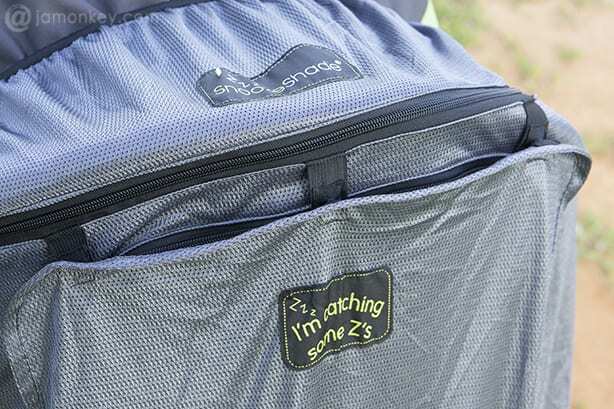 It's a mesh cover that goes over the front of your stroller to help block out the sun and prying eyes to your baby. I used mine on my Graco Jogging Stroller. When she is up and about I leave the shade open so I have easy access to her. It uses little snaps that are easy to remove. 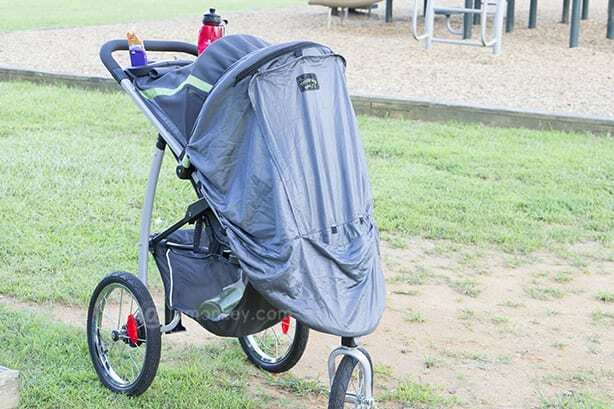 The straps that connect to the stroller are elastic to provide a better fit around different sized strollers. This jogger is pretty big so you can see it fits perfectly on it. 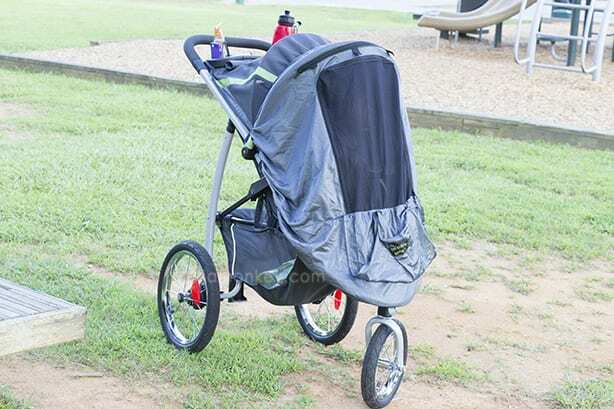 This model is the SnoozeShade Plus – Deluxe designed for joggers or large strollers in general. There are also covers for twin strollers, infant carriers and playards. If it seems to be a buggy day (mosquitos are bad in the south right now from all the rain) you can zip up the first layer of the SnoozeShade. It's a black mesh, making it very breathable. The two layer system makes this an all around great pick because it's a sun shade and bug net in one. The baby can still see out and what's going on around them without having to be eaten alive on your walk. When I know it's nap time I close the shade completely to block out everything so that it's easier for her to fall asleep. It fastens with easy buttons that “break away” fast when you need them to. With it closed it still has tiny holes all through the fabric so that it's getting air and it isn't turning into a little oven. The material offers high-rated sun protection (UPF40+) that shields your baby from 97.5% of harmful UV rays. If you're a heavy walker or jogger I would highly suggest getting a SnoozeShade so that you can take advantage of nap time as well as keeping the bugs out. It's the best design of the sun shades that I've seen out there. Plus, you don't have to have a separate cover for bugs, then another for sun. This is a great idea! I love that it provides protection from the sun and the bugs! Very nice how it has three modes of privacy and sun protection. This would be amazing for protecting little ones from the Las Vegas sun! It would be great to keep the Florida sun out of baby’s eyes! Heck I’d ride in that. Great way to keep off the hot sun & bugs. We love ours too! A must have product for sure! 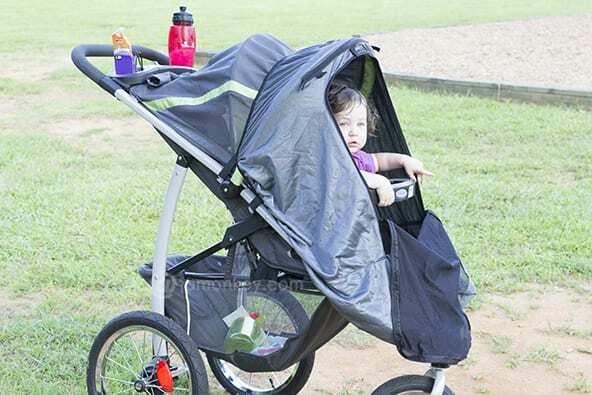 I need one of these for my jogging stroller — we get SO much sun here in Texas. This looks like a great product for the summer! I’m impressed that this almost completely protects from UV rays!